How many times have you taken a picture and then immediately hated it because your teeth looked, well… beige? Sure, you could just give them a quick tune-up with a photo-editing app and no one would be the wiser, but having IRL pearly whites would be a heck of a lot better, of course. In the working world where daily coffee(s) and after-work red wine flow freely, it's hard to maintain a white smile, and some toothpastes and rinses that claim to whiten your teeth "in a flash" don't cut it. We're the type who love instant results, and we're guessing you do too. That's why we investigated the most effective teeth whiteners that work quickly to hide our coffee (and malbec) habits, both according to dentists and consumers. See the winner (and runner-up) below! We can't say we're too surprised here. 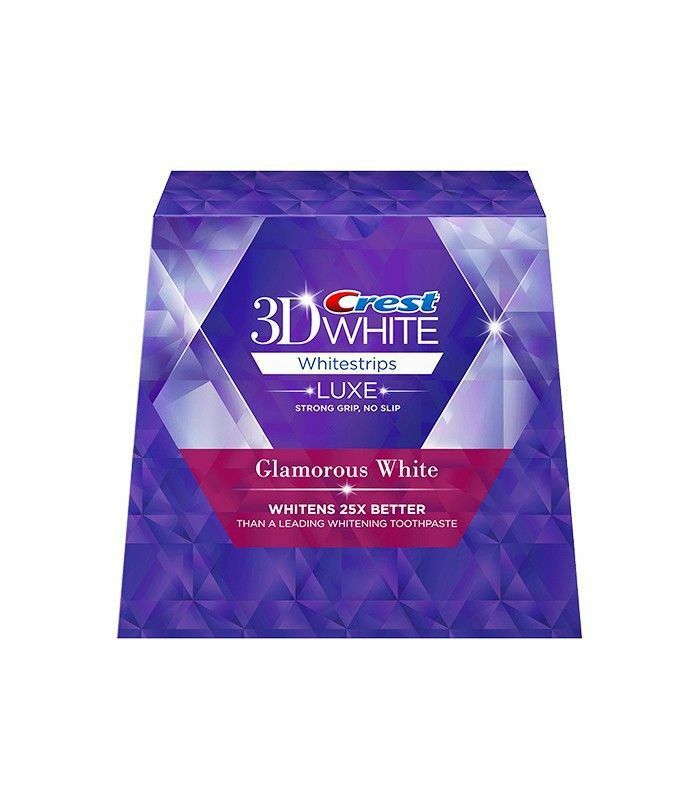 Crest Whitestrips have been a fan favorite for years (this particular variation has close to 6000 reviews on Amazon and an average review of four stars), but what's more reassuring is that dentists love them, too. "The bleach within the strips remains in contact with the tooth enamel long enough to deliver noticeable results. They contain a no-slip grip, which helps the strips stays put so you can talk and drink water while whitening teeth," says Dr. Gregg Lituchy of Lowenberg, Lituchy & Kantor. "Whitening strips, combined with daily use of a whitening toothpaste, are an affordable alternative to in-office whitening for maintaining a bright smile," Dr. Lituchy continued. "The length of time your teeth will stay whiter varies and is influenced by how often you drink coffee, tea, dark colas, red wine or smoke. The results vary from person to person depending on how receptive one's teeth are to the bleaching gel. White strips work to their maximum in two weeks—the whitest your teeth will ever be, and that is the day that you should stop. However, they're not as effective as in-office bleaching because Whitestrips contain a weaker percentage of hydrogen peroxide and don't remain isolated on the teeth as well as in-office whitening, but they are the best of the at-home options." Personally, I was skeptical about using this teeth-whitening system since so many celebrities and Instagram stars post pictures of themselves using a blue-light tooth whitener that I pessimistically assumed was a gimmick by way of paid advertising, but one use visibly brightened my teeth. A few more uses and my teeth were the whitest they'd been in years. 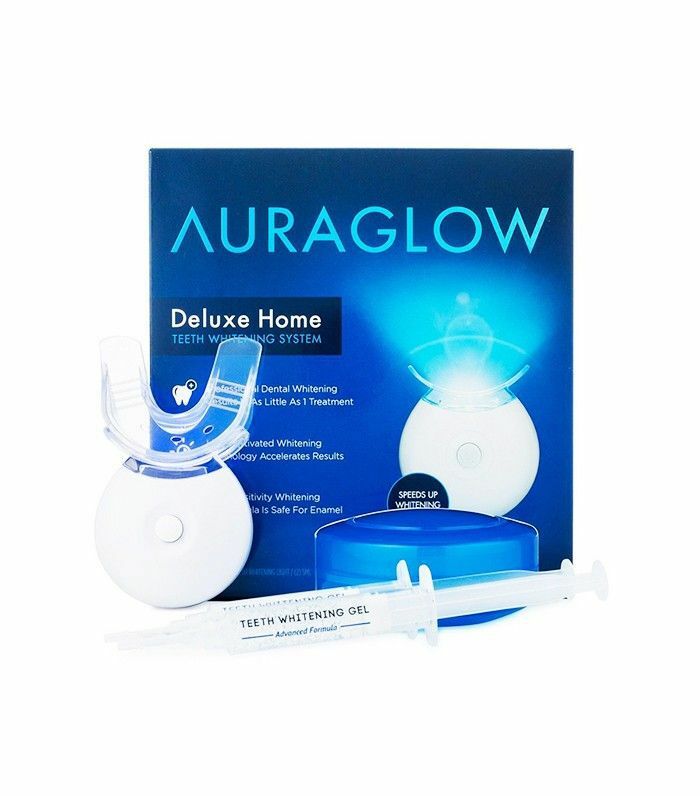 Consumers love the whitening tray, gel, and blue light (it's all quite easy to use), and celebrity dentist Dr. Nicholas Toscano (whose client roster boasts a slew of Victoria's Secret models) recommends Aura Glow to his clients. What's your favorite teeth whitener? Tell us below! Is This the Holy Grail of DIY Teeth Whitening?